Centerville-Washington Park District (CWPD) and Montgomery County Animal Resource Center (MCARC) are teaming up to remind local park visitors about current state and local regulations pertaining to dogs, including Ohio’s leash law. The leash law states that dogs must be properly leashed and controlled in public spaces. The MCARC will be visiting Centerville’s parks April through November to educate visitors on the reasons behind the law. Keeping a dog on leash is for their safety, the comfort and safety of other park visitors and also for the owner’s legal protection. An off-leash dog in a park could encounter a wild animal, ending with an injury to the dog or to the wildlife. A dog could eat something that makes it ill, or fall into a ditch or down a cliff side—all potentially tragic situations CWPD has seen in recent years. Not all dogs enjoy the company of other dogs and could become aggressive toward an approaching off-leash dog — leading to owner or dog injuries and potential legal problems. “It is important to remember that even though a dog may be friendly, not everyone loves your dog as much as you do! Fear of dogs is common. People have a right to walk in a public park without being afraid of encountering an off-leash dog. In addition, not everyone is physically able to withstand a dog jumping up on them, like the elderly or a small child. Our goal is to make sure that all residents are comfortable and safe visiting their parks,” said Ken Carter, CWPD Operations Manager. In addition to the Ohio leash law, CWPD regulations state that dogs must be controlled at all times on a visible leash not more than eight feet long. Pets are not permitted in a park area in which there is play equipment, a sprayground, a skatepark, or inside fenced baseball diamonds or tennis courts. MCARC will also remind visitors that dog owners are responsible for picking up pet waste and disposing of it appropriately. They will check for a current dog license to be displayed on all dogs over three months old. Licenses are required to be displayed on the dog’s collar. 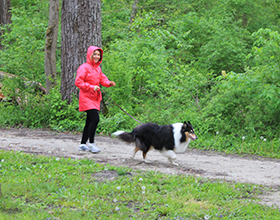 Local dog parks are recommended for owners to give their dog an off-leash experience. CWPD operates an off-leash park at Oak Grove Park, 1790 E. Social Row Road.